For the first and only time since his introduction in the beginning of Parshat Shmot, Moshe’s name is omitted from an entire parsha. Why is Moshe’s name omitted from Parshat Tetzave? The question is compounded by the fact that the omission seems clearly deliberate. Over and over again, the Torah creates settings in the parsha where Moshe’s name, by all rights, should appear – only to exclude it from the text on each occasion. This phenomenon repeats itself throughout the parsha. A fascinating Midrashic tradition connects the omission of Moshe’s name in Parshat Tetzave to a dramatic encounter between this great leader and his Creator, chronicled in the next parsha, Ki Tissa. The rabbis are deeply puzzled by this interchange. To what “book” does Moshe refer when he bargains with God for the people’s forgiveness? One Talmudic tradition, quoted by many later authorities, maintains that Moshe refers to the books of judgment which are opened on Rosh Hashana (the beginning of the year), when God determines the fate of His creations. Others, however, suggest that when Moshe exclaims, “erase me from Your book which You have written,” he is speaking of the Torah. If You will not forgive the Israelites, he argues, then, count me out! Erase me from the entire Torah text! I no longer want to be part of Your unfolding divine plan. Moshe has decreed his own fate and God cannot ignore that decree. Some “erasure” of this great leader’s name must occur. To fulfill the curse that Moshe has placed upon himself, therefore, God deliberately omits Moshe’s name from the entire parsha of Tetzave. Are the rabbis simply engaging in an intellectual exercise, associating two phenomena in arbitrary fashion when no real association exists? A closer look at the dramatic encounter between God and Moshe in Parshat Ki Tissa reveals a fascinating possibility. 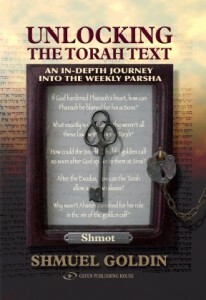 The rabbis perceive a powerful connection between that encounter and the philosophical theme of Parshat Tetzave. During the critical, turbulent moments following the sin of the golden calf, Moshe apparently makes a fundamental error in his own assessment of his leadership role – an error which must be emphatically and immediately corrected by God. The episode begins as Moshe turns to the Israelites and says, “You have committed a grievous sin, and now I will ascend to the Lord; perhaps I can atone for your sin.” You have distanced yourselves from God and can no longer approach Him on your own… I will ascend to meet Him; perhaps I can secure atonement for you. Ascending Mount Sinai, Moshe confronts his Creator: “I beseech You! This people have committed a grievous sin and have created for themselves a god of gold. And now if You will forgive their sin – and if not, erase me from Your book that You have written!” If You will not forgive the Israelites, allow me to atone for them. Punish me in their stead. God’s response is swift and emphatic: “Whoever has sinned against Me, I shall erase from my book.” Moshe, in spite of all that has happened, you still miss the point. I will accept no intermediary or substitute when it comes to personal responsibility. You cannot effect atonement for others. Those who have sinned must directly pay the price. Understood in this way, Moshe’s dramatic interchange with God following the chet ha’egel reflects the critical lessons learned from that event. Even Moshe has to be reminded that he cannot serve as the intermediary between God and His people. Once again, the Torah conveys the fundamental truth that is transmitted over and over again during the unfolding events at Sinai: the hallmark of divine worship is direct, personal encounter between man and God. We can now understand the connection drawn in the Midrash between this event and the omission of Moshe’s name in Parshat Tetzave. Parshat Tetzave is dedicated exclusively to the topic of the kehuna (priesthood). Within this parsha’s boundaries the Torah introduces the concept of the kehuna, outlines the detailed instructions for the fashioning of the priestly garments and discusses plans for the eventual investiture of Aharon and his descendents into their eternal roles as Kohanim. As we have already noted, the very concept of the priesthood carries the potential danger that the Kohen will be perceived, erroneously, as an intermediary between the people and their God rather than as the nation’s representative within the Temple (see Teruma 2, Approaches C). To clarify that no leader should ever perceive himself or be perceived as an essential go-between between the people and their Creator, Moshe’s name is omitted specifically from Parshat Tetzave. There could be no more appropriate response for the momentary, yet critical, lapse on Moshe’s part recorded in Parshat Ki Tissa – the instance, when, due to the unimaginable pressures of the moment, Moshe attempts to take upon himself the atonement of others. An alternative explanation for Moshe’s “absence” from Parshat Tetzave is offered by some scholars, based upon a Talmudic tradition rooted at the burning bush, the scene of Moshe’s call to leadership. Rabbi Shimon bar Yochai, noting God’s anger and the sudden introduction of Aharon, explains that at this point Moshe loses an honored opportunity. Moshe was originally destined to be not only Moshe Rabbeinu, the lawgiver, teacher and political leader of the Israelites, he was to be the Kohen Gadol, as well. Due to Moshe’s continued reluctance at the burning bush, however, God relieves him of that honor and bestows it upon his brother, Aharon. To mark this lost opportunity, Moshe’s name is omitted from Parshat Tetzave, the parsha that introduces the concept of the kehuna (priesthood). As intriguing as the Midrashic explanations for Moshe’s “absence” in Parshat Tetzave may be, a much simpler, yet equally powerful, pshat explanation can be offered. Parshat Tetzave is “Aharon’s parsha,” the section of biblical text which introduces the glorious role that Aharon and his descendents will assume across the ages. In recognition of the fact that this is his brother’s “moment,” Moshe is forced to take a step back out of the limelight. Moshe is certainly present, playing an essential role in the proceedings. Aharon, however, is center stage. Even Moshe, the greatest leader our people has known, must at times step aside, to allow others to shine. Many of us are so driven, in today’s modern Jewish community, towards our children’s academic success, that we rob them of their childhood. Tutors and extracurricular programs proliferate as we strive to ensure that each child is “well rounded” and given the full opportunity for success. “Free time” disappears in their overprogrammed world and pressures increase to the point where the process of getting into a yeshiva high school of choice feels similar to what getting into medical school felt like years ago. You don’t always have to be the best and the brightest in everything. That goal is, in fact, not only unhealthy but impossible. You don’t always have to be the star. You can’t always get the highest grade on the test. True success is often achieved through the enabling of others to reach their goals – and happiness often rests in the enjoyment of their accomplishments. Sometimes it’s appropriate to pass the ball and not take the shot. While these messages may sound self-evident when they are so openly stated, we should ask ourselves whether or not we communicate them clearly enough to our children. Certainly against the backdrop of the other messages we transmit, we cannot assume that these ideas are automatically understood. Centuries ago, God forces Moshe to take a step back and allow his brother, Aharon, to take “center stage.” For the sake of our children’s wellbeing, we should regularly convey the same lesson.